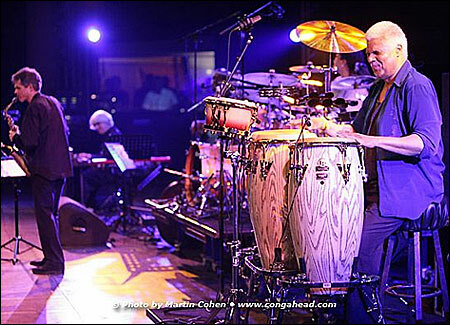 Don Alias with David Sanborn at the North Sea Jazz Festival. On June 30th, I traveled to Europe with my family to spend time with many of my Dutch friends in the music business, and to attend the largest music festival in the world: The North Sea Jazz Festival, which took place July 8th-10th at The Hague. In 2006 the festival will take place in Rotterdam. As usual, the talent was extraordinary, including Al Green, Chaka Khan, Juan De Marcos and the Afro-Cuban All Stars, Joe Zawinul, Joss Stone, Steps Ahead, Jamie Cullem, David Sanborn (with percussionist Don Alias), Roy Hargrove, Candy Dulfer, and Boney James (with percussionist Lenny Castro). These were the acts I had time to photograph - there were many more I couldn't get to! While in Holland we attended a dinner party in our honor held by Henk and Carla van Steenwijk, where we were delighted to see so many of our wonderful Dutch friends. On our way back, we stopped at a club to hear percussionist Gerardo Rosales 's band -- and met an old acquaintance, Dr. Salsa, and his wife Harriet. Dwight Muskita was great in helping me with my camera gear and getting us to the festival each day. Long-time LP® endorser and dear friend Jeroen de Rijk spent time with us in Volendam and was kind enough to get us to the airport. Gerardo Rosales and Astrid Pulles entertained us in their new home in Almere, Holland. I also was fortunate to be able to spend a few days with our German friends the Messners, catching up on the global music business and traveling by boat to Switzerland for a wonderful lunch. During a long overdue visit to percussionist Kornel Horvath and his family in Budapest, Hungary, we dined on the Danube River on the boat that has become The Columbus Jazz Society. We then traveled to the south of France where we spent our vacation, and visited with Edmond Bauthier and his wife Brigette at their country villa. On July 18th we all celebrated Matthew's 10th birthday with a wonderful lunch in Monte Carlo.